Here is the steps when you customize template style. JA Playmag is developed with LESS. When customizing template style, it's recommended to use .less files in templates/ja_playmag/less. When you enable developement mode, your site is running on LESS so that it's easy to debug to customize template style. When debug, Firebug is a good tool. You can customize style of template, track file to add the style to. After customizing your template, please disable Development mode, save the settings and compile LESS to CSS so that your customization will be compiled to CSS. If you are not familiar with LESS, you can customize your template with CSS. 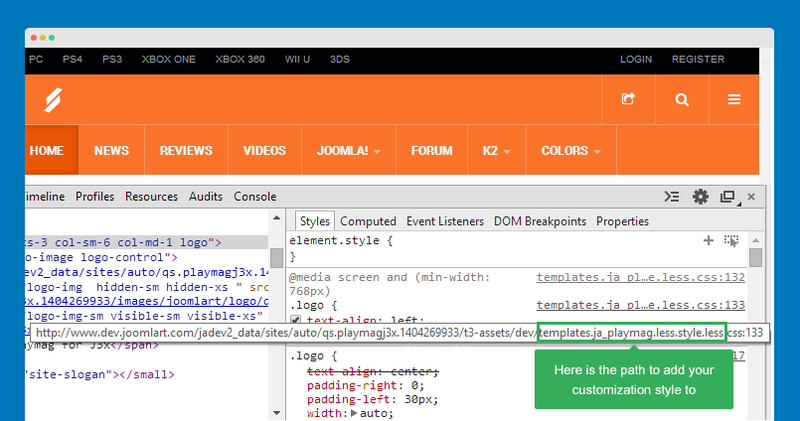 Add the customization style to the templates/ja_playmag/css/custom.css. The file is not overridden when compiling LESS to CSS and it works on both Development mode stataus: enabled and disabled. JA Playmag uses 2 logos, one for large and medium layout and one for small layout. To change logos, please open the template style. In the "Theme" setting, select the "Image" logo type, browse logo for large and medium layout then logo in small layout. Please note that the changes are only applied for CURRENT template style only. If you want to change for all, you have to change for all template styles. The style of logo is in the file: templates/ja_playmag/less/style.less, find the code and customize as you expect. Open the file: style.less again, find the code and customize as you expect. Open the file: templates/ja_playmag/tpls/blocks/header.less, find the code and customize as you expect. When changing size of the logo position, you should change the size of other positions in header block to fit the total size. The footer info of JA Playmag includes T3 logo and JA Playmag copyrights. The info can be customized. The T3 logo in footer block can be enabled or disabled with one click. 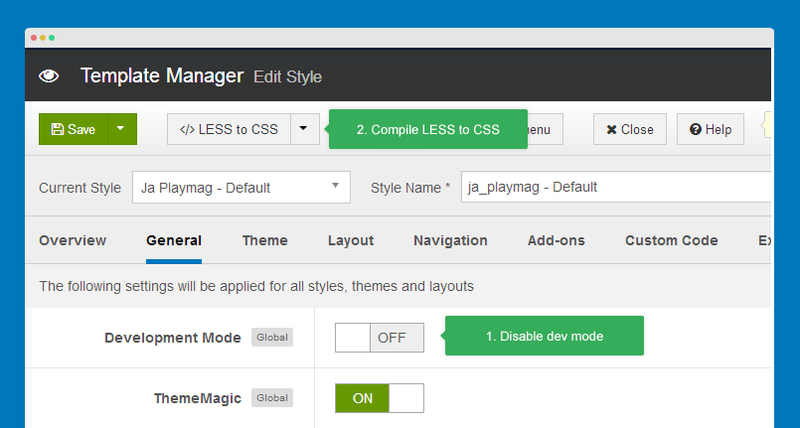 Open the JA Playmag template style manager, in the "General" tab, find the option "Show T3 Logo". JA Playmag main menu has special effect. The main menu is sticky but when you scoll down, it's not displayed, it's displayed when you scroll up. This design is based on user's behavior. When user scrolls down, you are focusing on content of the page so you don't need the main menu. 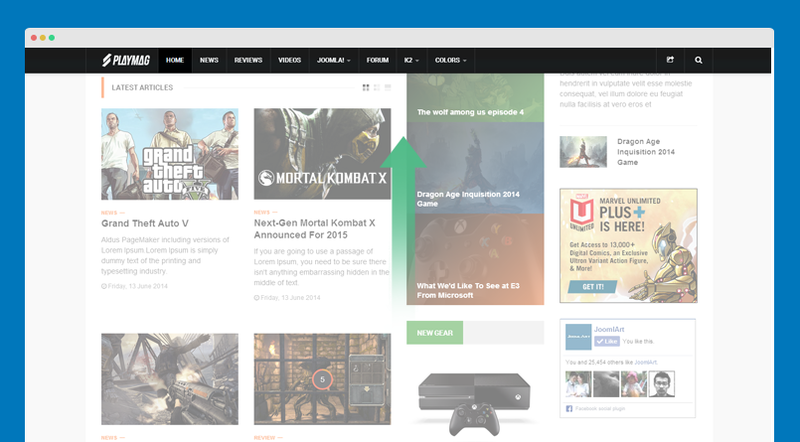 But when user scroll up, that means they are looking for something else, main menu will help them to travel around your site to find the thing they want.